Vice President-elect Venkaiah Naidu after winning the 15th Vice Presidential elections today, said that his appointment speaks of the beauty of the Indian parliamentary democracy, adding he will sincerely operate the functioning of the Rajya Sabha as the chairman. "I am humbled by the honour bestowed on me by electing me to the office of the Vice President of India, and by the virtue of which I will also be acting as the Chairman of the Rajya Sabha. I am grateful to the Members of Parliament belonging to different political parties who in an overwhelming manner have supported my candidature cutting across party line. This speaks of the beauty of our parliamentary democracy. 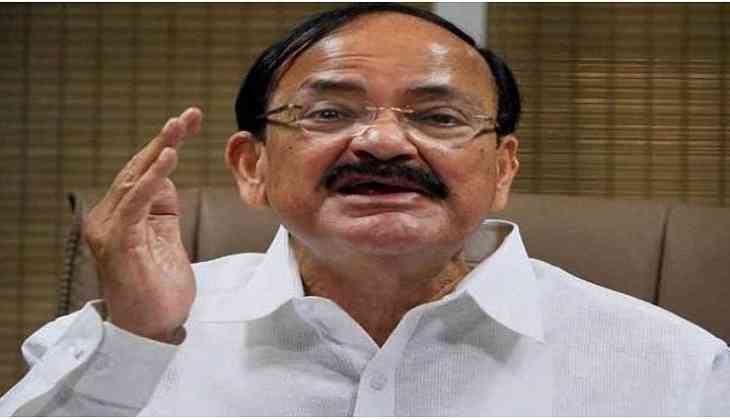 As the chairman of Rajya Sabha I will sincerely try to chair the functioning of the House to enable it to effectively further the larger interest of the nation," Naidu said at a gathering at his residence, where several political dignitaries descended to congratulate him. He added that he will uphold the dignity and decorum of the House with the cooperation of all the members by acting as per the rules of the House's procedure. "For a common man like me with a background of agriculture, it is like a milestone in India's democratic journey. I am really grateful to the Prime Minister Narendra Modi, Bharatiya Janata Party chief Amit Shah, to the leader of the various NDA constituents and also to the parties which are not part of the NDA who were kind enough to extend their support to me," he asserted. Meanwhile, wishes are pouring for Vice President-designate Venkaiah Naidu on being elected as the 13th Vice President. Speaking to ANI Union Minister Piyush Goyal said that Naidu's win with such a great margin shows a great symbol of "cross-party" acceptance. Speaking on the same, Union Minister Ravi Shankar Prasad said that India as a nation will move forward under Naidu. He further said that Naidu has a heart for the poor, but above all the "transformation" happening in India, which is very important. National Democratic Alliance (NDA) nominee and former union minister M. Venkaiah Naidu has been elected as the 13th Vice President of India with 516 votes. Opposition candidate Gopalkrishna Gandhi congratulated Naidu for winning Vice-Presidential polls. "I congratulate him on his victory and wish him all the best in his new office of Vice-President of India," Gopalkrishna Gandhi said. Prime Minister Narendra Modi congratulated Naidu on being elected as the next Vice President of India, expressing confidence that the former union minister will remain committed to the goal of nation building. West Bengal Chief Minister, Mamata Banerjee congratulated Naidu and said, "I Congratulate Naidu ji, our next Vice President of India. I wish him well. In tradition of democracy, Gopalkrishna Gandhi ji fought with dignity for certain ideal". Meanwhile, Andhra Pradesh Chief Minister Chandrababu Naidu also congratulated Naidu for being elected as new Vice President of India. He took to twitter saying, "Heartiest congratulations to Shri @MVenkaiahNaidu ji on winning the Vice-Presidential poll". Total 771 out of 785 MPs cast their votes today. However, it was revealed that 14 Members of Parliament (MPs) were not present during the voting process. Voting for Vice Presidential Election ended with a total poll percentage of 98.21%. The voting began at 10 a.m. earlier in the day.